The Monster Ecosphere Spawn Bag & Casing Package is for the grower looking to maximize the growing potential using the bulk casing method. This package will grow the most mushrooms possible per sq./ft.! 26% discount on this package! I was use to growing in tubs and just wanted something to make life easier in terms of space and efficiency and this was exactly what I was going for. The ecosphere makes it way easier to maintain the proper environment and it's a huge space saver as well. Not to mention the discount you get on casing and grain bags. Hands down if you are serious about growing this is what you want. Great product. Setup couldn't be much simpler, and makes it easy to control conditions. Highly recommend. For a first time grower I found this kit to take nearly all the guess work out. Nearly is only added as this is my first time and second guessing myself at every turn. Every worked as they said it would. Extremely easy instructions and setup. Just waiting the the fruits to start growing now! 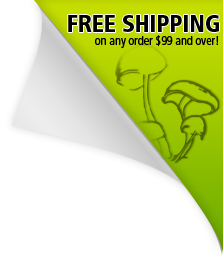 Looking forward to my next purchase and continue the mushroom growing experience. Thank you Midwest!!! Everything was included and shipped quickly. Temp and humidity stay very constant and is easy to adjust. Had a few questions and was emailed back 2 minutes later. Great customer service and good product.